Welcome to the TutorCruncher help site. Here you will find the language and processes of TutorCruncher explained in some detail. If you're not yet a user of TutorCruncher you can sign up for free or find out more at tutorcruncher.com. If you know the topic of your question, you can navigate to it using the search bar at the top of the page. Please note that this is where administrators should be accessing their help content. If you are a tutor, then you should click here to access the tutor help page. If this is the first time you are using TutorCruncher, then you've come to the right place. TutorCruncher is cloud based tutoring business management software. With TutorCruncher, you can manage tutors, clients and students, plan lessons, send invoices, keep track of payments, and much much more. TutorCruncher makes all the administration easy so that you can focus your time on your students and clients, rather than scheduling and accounting. If you haven't already made an account, click here to sign up for a free account. When you first log in to TutorCruncher, you will be logged in to a demo branch as an administrator. This is a fictional branch of your tutoring agency and it is loaded with dummy data that you can use to explore and test the system. Nothing you do in this branch will affect the information in your real branch, so feel free to try anything and everything, including invoicing and taking payments. Even our card payment system has been set up on this branch, using a test account. How do I change branch? You can change branch by clicking your avatar in the top right hand corner of the screen and selecting the branch you wish to view. Clicking on the button at the top right hand corner of the screen will bring out the account menu. Here you can edit your account details, log out, and set your active role. At the top of the page is the search bar. The search bar is a powerful tool that allows you to search for everything from names and phone numbers to lessons and invoices. Next to the search bar is the branch menu. Once you have finished using demo branch, you can switch to your real branch using this menu. You can always switch back to demo branch if you want to test out a feature. On the left hand side is the navigation menu. This is what you will be using to navigate through TutorCruncher. And finally at the bottom right is the intercom bubble. Clicking on it will open up the intercom panel where you can have a chat with us during regular business hours. We also regularly update TutorCruncher with new and improved features. The details of these will be messaged to you through intercom, whenever updates are made. 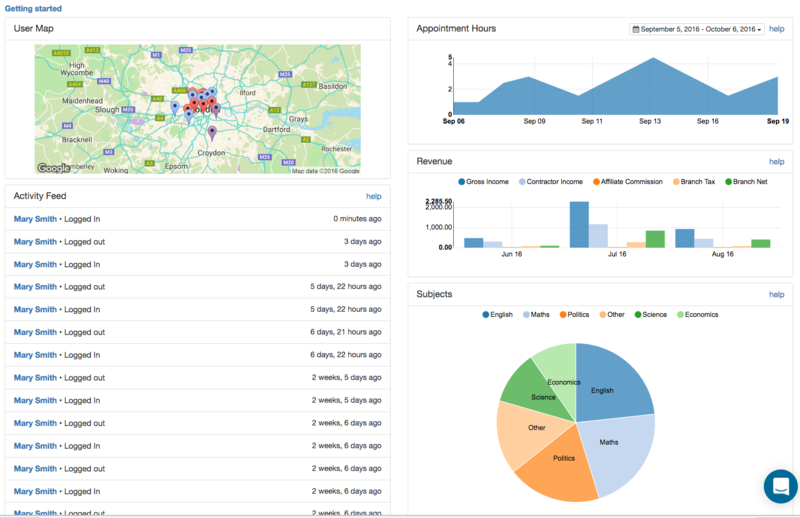 The administrator dashboard is a great way to get an overview of how your company is doing. The activity feed shows you a list of recent actions performed on your site. It shows which users have logged in and out, what they've been doing and when, and provides links to their profiles. There are also links to the items your users have created or edited. On the right hand side of the page are charts of lessons over time, revenue over time, and your most regularly taught subjects. Just below the 'Dashboard' title is a link to your user map, so you can see how your users are spread out geographically. Now let's try creating a few new users. Head to the tutors list by clicking People > Tutors in the navigation menu. This is where you can view all your tutors and filter by 'Approved', 'Pending', and 'Rejected/Dormant'. At the top of the page, click the 'Create New Tutor' button. Fill in some example data with an example email (try something like your-name@example.com) and click 'Submit'. You'll then be taken to your new tutor's details page. This is where you'll find all the information about your tutor including their teaching skills and qualifications, current jobs, activity, and more. Use the buttons at the top to try editing the tutor's information, uploading a CV, placing a label, and changing their status to 'Approved'. You can see more info by watching our tutorial video. Head to the clients list by clicking People > Clients in the navigation menu. This is where you can view all your clients and filter by 'Live', 'Prospect', and 'Dormant'. At the top of the page, click the 'Create New Client' button. Fill in some example data and click 'Submit. You'll then be taken to your new client's details page. Here you can see your client's balance, balance history, any jobs they are associated with, students, invoices and more. You can create a new student in the same way you create tutors and clients. Students will either have to be linked to an existing client or be created as a new client themselves. Alternatively, you can also add a new client as a student. At the top of the client's profile, click the 'Add as Student' button. You should then see the client's name under their 'Students' panel, added as a student. Click on it and you will be taken to your student's profile. The third option to create a student is to go on a client's profile and add a student directly to a client by clicking on the plus sign next to Students. As you can see, users in TutorCruncher can be given multiple roles. This usually applies to clients and students, but can be useful in other situations. For example, your administrators could also be tutors, and you can give yourself client and tutor roles to check if invoices and payment orders are displaying correctly. Now that we've created some users, lets create a job and some lessons. In TutorCruncher, jobs are the link between clients, tutors, and students. Jobs are where you can schedule related lessons. You can set which students and tutors are on the job, and tutors can even sign up for jobs that are 'Available for Application'. Navigate to the Activity > Jobs page and click on 'Create New Job' at the top of the page. You can do much more with jobs, including sending out notifications to tutors and getting them to apply for it. When you created the job, and added the student(s) and tutor, you can create a lesson by clicking the 'Add Lesson' button. Once the lesson has been marked complete it is ready for billing. You can find more information by navigating through the help site, and there are more tutorial videos with step by step instructions that can be accessed through the menu above. If you have forgotten your password, or have never set it in the first place, go to the login page for the company you wish to log in to (should be in the format https://secure.tutorcruncher.com/COMPANY_URL_BIT) and click 'Reset Password'. You will now receive a link to reset your password to the email address you put in. You need to contact the company your account is with for this information. I have put in my email address, but haven't received a password reset email. Are you sure your email address is correct? If not, contact the company your account is with. Otherwise, check your spam/junk folder in your email inbox just to make sure. One of my users has requested a password reset, but hasn't received a password reset email. Go to the user's profile. Under the panel 'Activity', you can view the user's latest activity. If there isn't an entry for 'Requested a password reset' there, then they may have entered the wrong email address. It's best to check their email address on their proile with them at this point. If there is an entry for 'Requested a password reset', then you can look in Communications > Outbound Emails to see if the email was sent. One of my users has forgetten their password, what should I do? You just need to point them towards your password reset page, which is available from your company's log in page (found by logging out). The link has expired to set my password, what do I do? Simply go to the reset password page for the company you wish to log in to, and reset your password. Even if you have never set a password, you can still receive a password reset email.